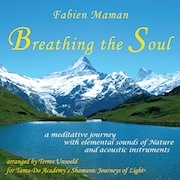 This brilliant healing CD by Fabien Maman uses 21 acoustic instruments to realign the chakras and subtle energy fields - moving up the body from the feet to the head. 45 minutes long, this is the perfect CD for practitioners who wish to "hold the energy field" for their clients. After more than 7 years' research, Fabien Maman developed the now famous system of using "The Cycle of Fifths" (starting with low F) instead of a diatonic scale (do, re, mi) to balance and empower the chakras. 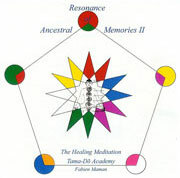 He has also developed a method to align the subtle energy fields (Aura) through an Overtone Progression. This bio dynamic system of moving energy up the body to balance the chakras, as well as expanding energy around the body in the subtle energy fields creates a whirlpool of energy, allowing deep transformation. Limit is 1 download per order. Master Guide Fabien Maman and Faery/Shaman Terres Unsoeld have been leading Shamanic Journeys in France, UK and Switzerland for more than ten years. 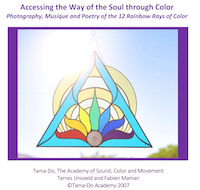 Created for Tama-Do ("The Way of the Soul") Academy, these journeys expand our consciousness through physical, spiritual and cosmic exploration in the Heart of Nature. We call this subtle approach to the vibrational realm - Shamanism of the Light® - for it is the Light from whence we came, and where, as Souls, we are going. Fabien Maman, the founding father of vibrational sound therapy, draws on Sacred ancient Chinese, Greek and Indian traditions to perform his Seasonal Harmonizing Concerts around the world. Inspired by Chinese medicine, Fabien has developed a system of correspondences between the elements, meridians, chakras, directions and stars and the musical key, mode, instrument, rhythm and energy of each season. When played, these acoustic sounds bring human beings, nature and the cosmos into healing harmony. According to Chinese medicine, there are five elements (wood, fire, earth, metal and water), each of which resonate with an organ, acupuncture meridian and season. Fabien's research also includes the stars, subtle bodies and chakras. For him everything is fundamentally connected. He always says that all the components of life are inseparable, for each of them plays the role of an instrumentalist in this immense orchestra, the universe, under divine direction! For more than thirty years, Fabien has been performing his Seasonal Healing Concerts around the world. 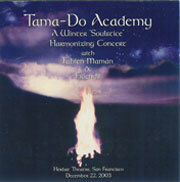 In 2003, Tama-Do Academy decided to produce a series of 4 live recordings of Tama-Do Seasonal Harmonizing Concert; one for each season. Only acoustic instruments are used, as they best resonate with the human body and the energy fields. Performers attend a 2-hour workshop, one day rehearsal, one day tech... and then performance/recording! The results are pure magic, as can only be found in a live recording. 2 of the 4 CDs are complete. Stay tuned! On December 22, 2003, Fabien joined forces with 50 professional musicians, singers and dancers to perform this historic Winter "Soulstice" Healing and Harmonizing Concert at the Herbst Theatre in San Francisco. Members of Sound Tribe Sector Nine, Hamsa Lila, TranceZenDance, Foxgluv, and many others, donated their artistic services in this ground-breaking collaboration to demonstrate the full potential of music as medicine. This amazing piece of symphonic harmony is based on Pentatonic modes of Winter in the key of D. The master instrument is the drum. (9 drums!). This live recording brings energy, vitality and joy to the darkest time of the year! Fabien Maman, the founding father of vibrational sound therapy, follows his Winter Soulstice performance with a Summer Harmonizing Concert. 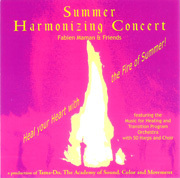 This time, 50 Harps and Choir of the Music for Healing and Transition Program Orchestra in the Chapel of Notre Dame College of Cleveland, Ohio, join Fabien for this live acoustic concert celebrating the energy, vitality and chaotic joy of Summer! 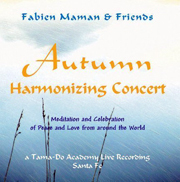 Tama-Do Academy presents Fabien Maman, the founding father of vibrational sound therapy, with MJ Greenmountain & Friends in this live acoustic concert to harmonize with the season of Autumn. With ancient Sanskrit, Tibetan, African, Brazilian, Rastafarian and Yoruban chants, this CD is a meditation and celebration of Peace and Love from around the world. In 1984 musician/composer, acupuncturist and martial artist Fabien Maman received Tao Yin Fa® Series I. 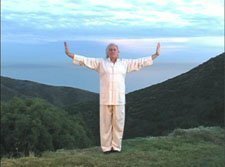 He received 5 Series in all, bringing his own form of Qi Gong of the Light® to the world. 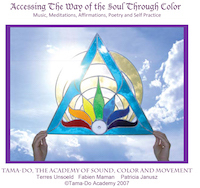 Tao Yin Fa® Series I (Movement for Health) and Series II (Psycho-Spiritual Movement) are practiced every day by students of Tama-Do, The Academy of Sound, Color and Movement®. 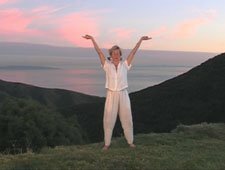 We offer the teachings to you for the first time on DVD, so that, wherever you are, you can join us each morning, as we do our daily practice! We have added Zhineng Qi Gong, which Fabien received from his Master Pang Ming and the Acupuncture Meridian Stretches which Terres received from her Master Wataru Ohashi. "The seed of the spiritual is rooted in the physical. producing a fusion which allows you to step into your Soul." Download link will be found on online Confirmation page after checkout and also a Product Delivery Instructions email with the link will be emailed to you. Find zip file in downloads folder; then drag & drop zip file onto desktop. On Mac, double click zip file to extract. On pc, right click zip file and Extract All. Choose location to extract it to; perhaps make a new folder for it. Double click on extracted CD or DVD folder to open. Click on individual tracks to play music/view movies.